Are you looking for a great gift for the carpenter in your life? Does a friend or loved one frame houses for a living? Do they need a new tool belt? 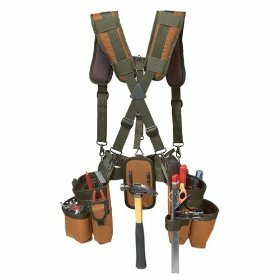 If so then I highly recommend the Bucket Boss 55039 Tool Belt. Some of the guys that work on my crew use this type of tool belt and they are really great. The beauty of this type of tool belt is the suspender type design. Tool belts are famous for falling down every time you bend over to pick something up. This type of tool belt won’t do that and it helps distribute the load more evenly across your body to reduce stress on your back.